In Kenya, traditional banking methods are being superseded by mobile banking apps such as M-PESA, which allow users to pay bills, transfer and even withdraw money by simply using their smartphone. However, gaining a credit history can be problematic in countries where credit cards are not a part of everyday life. 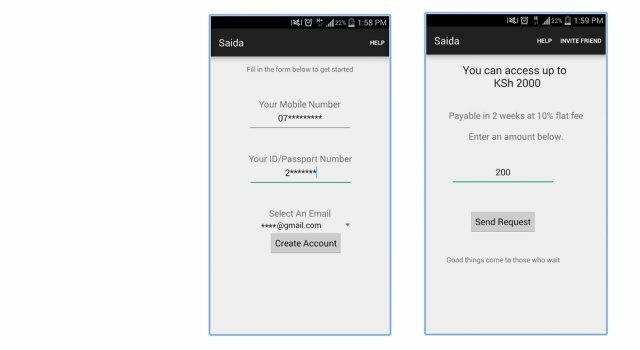 Saida is an app that integrates with M-PESA, and allows users access to short-term loans that are calculated based on their phone data. Saida uses phone data as a proxy for credit suitability. Information such as how regularly a user tops up, data usage and phone model is used to calculate how much money a user can borrow. Greenshoe, the company founded by Kenyans Kyale Mwendwa and Kenneth Ngetha, has developed Saida with backing from Y Combinator. Ngetha explains: “The information that [users] are able to share is how they are using their cellphone plan. That tells us a lot about their income cycle and how much they earn.” Based on the user’s phone data, a maximum loan amount is then made available for the user to transfer into their M-PESA account, which they must pay back in four weeks. With many Kenyans living in rural villages, Saida offers a convenient alternative to travelling and queuing for banking services. With mobile banking use continuing to expand in Kenya and other developing nations, Saida could become a valuable tool in supporting emerging entrepreneurs in rapidly expanding markets. Could this scheme work in developed nations, too? The post Short-term loans for Kenyan entrepreneurs through mobile banking appeared first on Springwise.